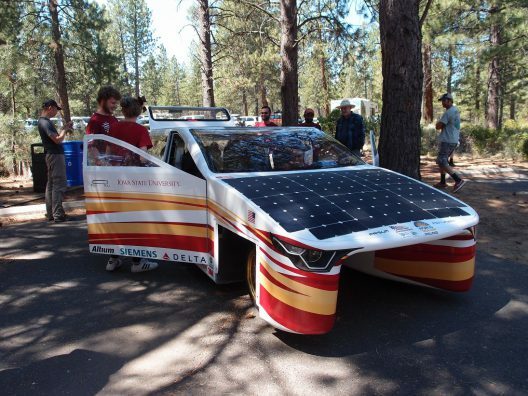 Sunday, July 22 found your editor at Bend, Oregon’s High Desert Museum for the finish of the 2018 American Solar Challenge. The race started in Omaha, Nebraska on July 14 and followed parts of the Oregon National Historic Trail and the Lewis and Clark Trail. Teams came from colleges and universities all over the world. Six of the single-occupant vehicles (SOV) and one multi-occupant vehicle (MOV) managed the entire 1762.7 miles without breakdown or significant mechanical difficulties. 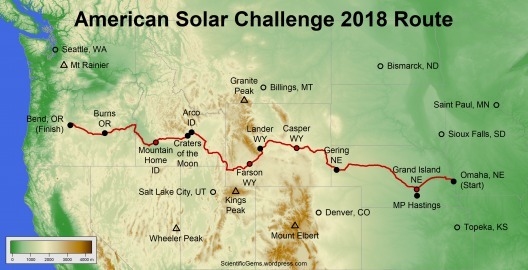 Considering the cars had to make it over the Rockies, and scale a 902 meter (2,958 foot) climb in only 35 kilometers (21.7 miles), between Lander and Farson, Wyoming, the number that made it across the finish line is impressive. 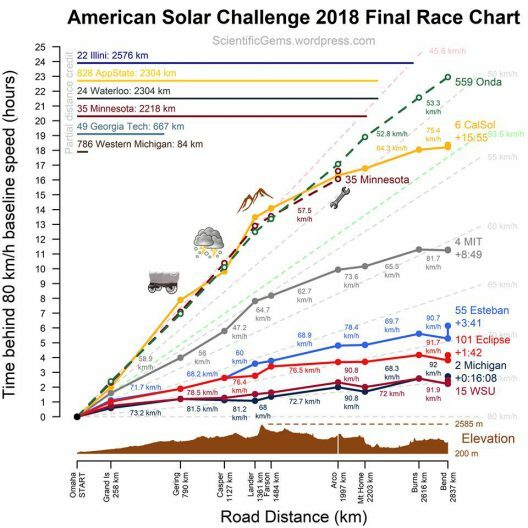 Rough numbers show the number one Sydney Team made the 1795 mile trek in 37 hours and 55 minutes – averaging over 47 mph across western America. Given the rising nature of the terrain for most of the trip, the lead car made it in no more time than a typical family journey complete with gas stops, potty breaks, etc. Your editor and his friend Mary Maxwell were privileged to meet some of the drivers and support team members. One of the most enthusiastic was 84-year-old Chuck Hutchins, number 1 cheerleader for the Michigan team. 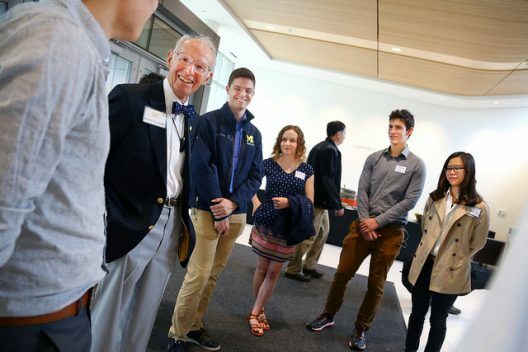 A long list of testimonials thanking companies that supported the University of Michigan’s Novum team includes a heartfelt tribute to Chuck, a U of Michigan graduate in mechanical engineering who went on to co-found Manufacturing Data Systems, Inc. He doubtless shares a wealth of knowledge as well as enthusiasm in mentoring the team. Unlike many events which enforce a strictly hands-off approach to viewing the competing vehicles, ASC teams invited us to “try on” the multi-occupancy vehicles. Urged to sit in Iowa State’s prISUm MOV, we discover that it’s quite roomy, has a great sound system (belting out Neil Diamond at that moment), and a huge “infotainment” screen in the center of an otherwise austere dashboard. Drivers and passengers could be excused for wanting to flood their senses with sound while driving without air conditioning across desert terrain. Even though it did not qualify in the event, it ran strongly and won Anthony Dekker’s (see below) approval as the Most Desirable Car. Many parts, although made from aluminum and other lighter metals (the whole car weighs a mere 1,100 pounds) seem massive, perhaps an outcome of its farm country heritage. John Deere, along with other major players, sponsors the team. Your editor was able to follow the Challenge on a blog called, “Scientific Gems, Facts, ideas, and images from the shoreline of science.” It had detailed daily updates and knowledgeable insights into the event. Editor Anthony Decker seems to be as much a fanatic about following solar racing as your editor is about following electric aviation. A significant difference is that “Tony” publishes some pretty daunting items such as “Conceptual Distance in Social Network Analysis,” in the Journal of Social Structure, and “Applying Social Network Analysis Concepts to Military C4ISR Architectures,” in Connections, the official journal of the International Network for Social Network Analysis. These cars, capable of hitting highway speeds and conquering the Rockies, are precursors to future designs. Their incredible lightness shows a recognition of what can be achieved with modern materials. Their comfort, in the MOV class, shows this technology can also be applied to a realistic road vehicle. Can the lessons continually learned by these solar road warriors be of use in the sky? Your editor thinks yes, and hopes for further progress in this realm.